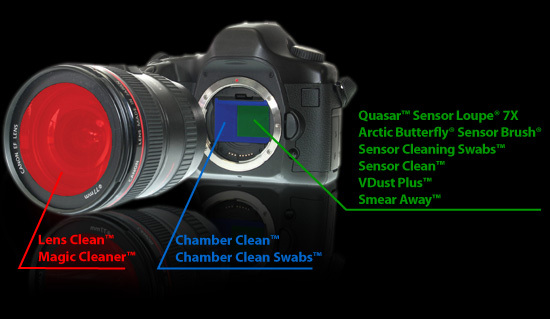 As you can see from the diagram, VisibleDust is not just about cleaning the sensor. Our myriad of products are orientated to fulfil all of your camera cleaning needs to help keep your images spotless. The fight against dust is relentless when dealing in the digital world. Merely cleaning your sensor is not enough for as soon as you remove one speck, another has taken its place. It is necessary to thoroughly clean you sensor, chamber area and lenses to minimize the frequency of dust contamination. Our focus here is to describe the intricacies of 'wet' cleaning your digital sensor, so we will not discuss the Arctic Butterfly®/Sensor Brush™ that are used while performing a 'dry' cleaning or any of the various other products. What we will focus on here is the liquids and swabs used to remove any unwanted stains or smears that may appear on your sensor. Sensor Clean™ — this product is best suited for the removal of water based stains on your sensor. It provides an anti-static barrier for the prevention of dust accumulation, it has anti-fogging capabilities and prevents streaking as it cleans. If you intend to work in a humid or arid climate, Sensor Clean™ will provide a buffer against vapour build up and dust collection. VDust Plus™ — this solution fits in the middle ground where it will clean both water based stains and light oil based stains. If you are unsure as to the nature of the particular stain or smear that you have on your sensor, VDust Plus™ is an excellent choice. It provides great cleaning ability and provides a moderate anti-static barrier. Smear Away™ — this concoction is the strong sensitive type. It will remove any tough stains that finds their way onto your sensor safely and effectively. As it cleans, Smear Away™ acts as a buffer to prevent any hard and potentially harmful dust particles from scraping against the IR filter. It provides excellent dust repellent properties and prevents friction build up. Due to the nature of some tough oil stains, it may leave minor streaks behind and a follow up with Sensor Clean™ is usually an excellent measure. Swabs — VisibleDust has produced two distinstive types of swab due to the varying consistancies of the cleaning liquids we offer, though after time we realized that the green series swabs could be used effectively with all of our solutions. DHAP (orange) Sensor Cleaning Vswabs® — specifically designed to be used with our VDust Plus™ solution, the DHAP swabs also work well with our Smear Away™ liquid. The unique woven pattern increases absorbency while reducing fiber shedding. The ultra soft material used in making the swab is the same that is used to clean extremely sensitive surfaces such as high powered space telescopes. This delicate fabric is ideal for critical cleaning since less pressure is received by the sensor, minimizing any abrasive action when coming in contact with any hard debris. 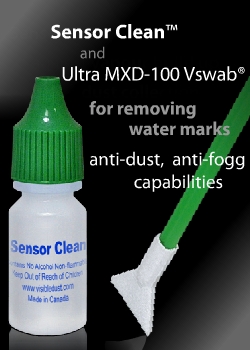 MXD-100 (green) Sensor Cleaning Vswabs® — the multi-fabric design of the green swabs make them compatible with all of our sensor cleaning solutions: Sensor Clean™, VDust Plus™, and Smear Away™. Although the MXD-100 swabs are a little thicker than the DHAP, they are still softer than our competitors. Streak Prevention — the ability to prevent streaks after cleaning. Removing debris from the sensor only to find streaks left behind can be frustrating. Anti-Static — the ability to prevent dust attraction to the filter surface after cleaning. After cleaning the filter it is desirable to have an anti-static barrier to reduce dust attraction in the future. Cleaning Power — the ability to remove water, oil and protein. The water that appears on the sensor usually comes from humidity, raindrops, and spittle. Oil appears on the sensor when it is cast from the mechanisms (mirror, shutter) or from accidental contact with the IR filter with a finger. Proteins and bacteria can accumulate in the form of dust (ie pollen) or from breathing or spitting on the filter. Smear Removal Power — the ability to remove lubricant contamination from the sensor surface. Smears occur when a liquid contamination develops on the filter and an attempt is made to clean it with a dry method such as a brush. This spreads the contaminant over the sensor creating a 'smear.' Smears sound detrimental but are easily removed with the proper tools.